Kosakonia sacchari sp. nov. is a new species within the new genus Kosakonia, which was included in the genus Enterobacter. K. sacchari is a nitrogen-fixing bacterium named for its association with sugarcane (Saccharum officinarum L.). K. sacchari bacteria are Gram-negative, aerobic, non-spore-forming, motile rods. Strain SP1T (=CGMCC1.12102T=LMG 26783T) is the type strain of the _K. sacchari sp. nov and is able to colonize and fix N2 in association with sugarcane plants, thus promoting plant growth. Here we summarize the features of strain SP1T and describe its complete genome sequence. The genome contains a single chromosome and no plasmids, 4,902,024 nucleotides with 53.7% GC content, 4,460 protein-coding genes and 105 RNA genes including 22 rRNA genes, 82 tRNA genes, and 1 ncRNA gene. The genus Enterobacter belonging to the family Enterobacteriaceae is polyphyletic based on 16S rRNA gene sequence analysis [1–3]. Recently, eleven species belonging to the genus Enterobacter were transferred into the genus Cronobacter and three novel genera (Lelliottia, Pluralibacter, and Kosakonia) based on multilocus sequence analysis of protein-coding genes, rpoB (RNA polymerase β-subunit gene), gyrB (DNA gyrase subunit B gene), infB (initiation translation factor 2 gene), and atpD (ATP synthase β-subunit gene) . Enterobacter cowanii, E. radicincitans, E. oryzae and E. arachidis were reclassified as Kosakonia cowanii, K. radicincitans, K. oryzae and K. arachidis, respectively . 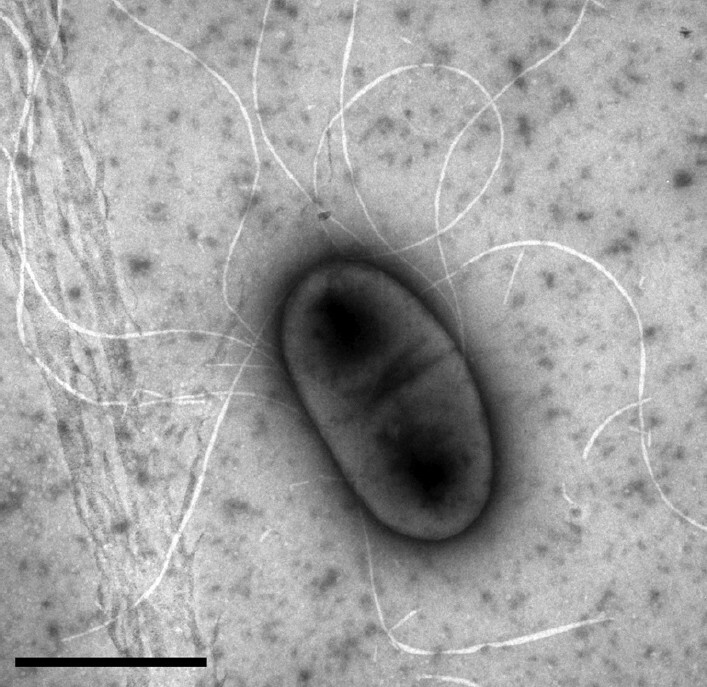 Enterobacter sacchari is a new species named for nitrogen-fixing bacteria in association with sugarcane (Saccharum officinarum L.) [2,4] and has been reclassified as Kosakonia sacchari . K. sacchari is able to colonize sugarcane plants, fix N2 in association with sugarcane plants and promote plant growth . K. sacchari strain SP1T was isolated from a surface-sterilized stem of sugarcane cultivar GT11 grown in Nanning, Guangxi, China in 1994. It has now been designated the type strain of K. sacchari sp. nov [2,3]. Here we present a summary of its features  and the complete genome sequence and annotation for _K. sacchari strain SP1T (=CGMCC1.12102T=LMG 26783T). K. sacchari type strain SP1T is a Gram-negative, non-spore-forming, motile rod with peritrichous flagella (Figure 1., Table 1.). It grows aerobically but reduces N2 to NH3 at a low pO2. It is able to grow and fix N2 on media containing 10% (w/v) cane sugar or sucrose and forms circular, convex, smooth colonies with entire margins on solid media. It grows best around 30°C and pH 7. Phylogenetic analysis of the 16S rRNA gene sequences from SP1T, the type strains of species of the genus Enterobacter and the type strains of type species of other genera in the family Enterobacteriaceae showed that SP1T formed a monophyletic group with the type strain of E. cloacae (the type species of the genus Enterobacter) . However, phylogenetic analysis of the rpoB gene sequences showed that SP1T diverged from E. cloacae . Here, phylogenetic analysis of the 16S rRNA gene sequences from SP1T, other type strains in the genus Kosakonia, Like typical members in the genera Enterobacter and Kosakonia, K. sacchari SP1T utilizes L-alanine, D-cellobiose, citrate, D-fructose, D-galactose, D-glucose, glycerol, maltose, D-mannitol and D-mannose [2,6,7]. K. sacchari differentiates from E. cloacae by utilization of D-arabitol and L-fucose, and the type strain of E. cloacae showed that K. sacchari formed a monophyletic group with K. radicincitans, K. oryzae, and K. arachidis and diverged from K. cowanii (the type species of the genus Kosakonia) and E. cloacae (Figure 2.). Transmission electron micrograph showing a negative-stained cell of the Kosakonia sacchari type strain SP1T . The scale bar represents 1 µm. Phylogenetic tree based on 16S rRNA gene sequences of Kosakonia sacchari type strain SP1T (□), the type strains of other species in the genus Kosakonia, and the type strain of Enterobacter cloacae. The sequences were aligned with the CLUSTAL W program and were constructed with the neighbor-joining algorithm integrated in the MEGA 5.0 program . The phylogenetic tree was tested with 1,000 bootstrap replicates. Bootstrap values are shown at the nodes. The GenBank accession numbers of the sequences are indicated in parentheses. The scale bar represents a 0.1% nucleotide sequence divergence. Evidence codes - IDA: Inferred from Direct Assay; TAS: Traceable Author Statement (i.e., a direct report exists in the literature); NAS: Non-traceable Author Statement (i.e., not directly observed for the living, isolated sample, but based on a generally accepted property for the species, or anecdotal evidence). differentiates from K. radicincitans by utilization of putrescine, D-arabitol, L-fucose and α-methyl-D-glucoside, and differentiates from K. oryzae by utilization of putrescine, D-arabitol and L-rhamnose . K. sacchari SP1T was selected for sequencing because it is the type strain of K. sacchari, and on the basis of its scientific interest as an endophyte that has the potential to promote the growth of agriculturally important crops by nitrogen fixation . Its 16S rRNA gene sequence is deposited in GenBank under the accession number JQ001784. Its genome sequence is deposited in GenBank under the accession number CP007215.2. A summary of the genome sequencing project information and its association with MIGS version 2.0 compliance is shown in Table 2. K. sacchari SP1T was grown in liquid Luria-Bertani (LB) medium at 30°C to early stationary phase. The genome DNA was extracted from the cells by using a TIANamp bacterial DNA kit (Tiangen Biotech, Beijing, China). DNA quality and quantity were determined with a Nanodrop spectrometer (Thermo Scientific, Wilmington, USA). The genome DNA of K. sacchari strain SP1T was first constructed into a 500-bp-insert library and sequenced by an Illumina HiSeq 2000 sequencing system. A draft genome of 4,945,084 nucleotides containing 239 contigs was obtained and deposited at DDBJ/EMBL/GenBank under the accession no. AMSC00000000 . However, 84,628 nucleotides (203 short contigs) of the draft genome were accidently contaminated by sequences from eukaryotic organisms. Therefore, the genome of SP1T was resequenced at the Duke University Genome Sequencing & Analysis Core Resource using the Pacific Biosciences’ Single Molecule, Real-Time (SMRT) sequencing technology (http://www.pacificbiosciences.com/). A 4 – 10 Kb insert library was constructed. Sequencing was run on a single SMRT Cell. The sequencing data were assembled using the Hierarchical Genome Assembly Process (HGAP) with smrtanalysis-2.1.1. The final assembly of the chromosome produced 63-fold coverage of the genome. Automated genome annotation was completed using the NCBI Prokaryotic Genome Annotation Pipeline. Product description annotations were obtained using searches against the KEGG, InterPro, and COG databases. Genes with signal peptides were predicted using SignalP . Genes with transmembrane helices were predicted using TMHMM . Genes for tRNA were found by tRNAScanSE . Ribosomal RNAs were found by using BLASTN vs. ribosomal RNA databases, and 5S rRNA hits were further refined using Cmsearch (http://manpages.ubuntu.com/manpages/raring/man1/cmsearch.1.html). Two hundred twenty seven disrupted genes were replaced by the complete gene sequences obtained from the first Illumina HiSeq 2000 sequencing. 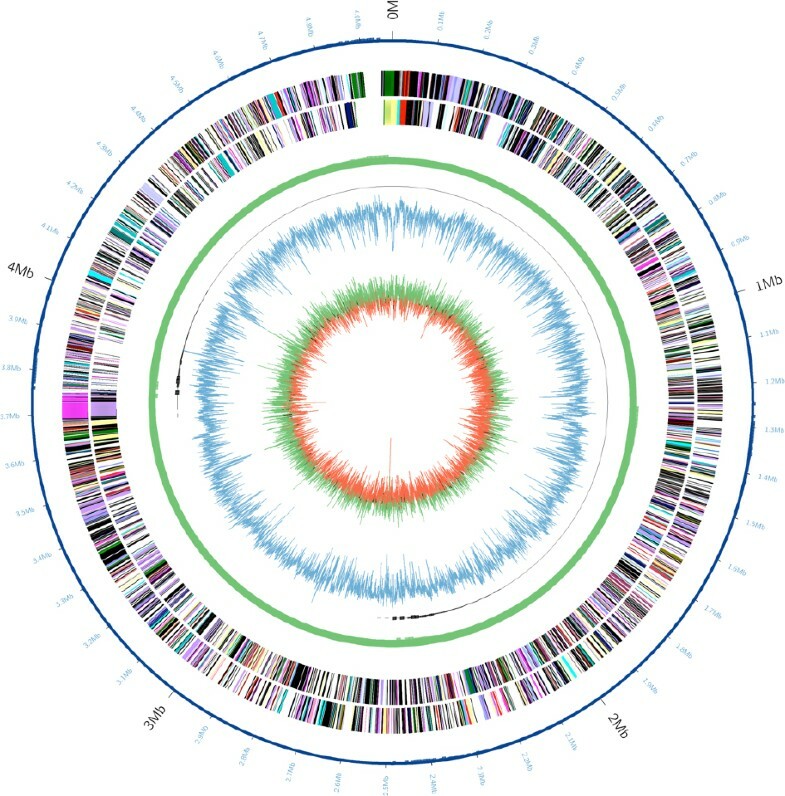 Graphical circular map of the chromosome of Kosakonia sacchari type strain SP1T. From outside to the center: Genes on forward strand (color by SEED subsystems ), Genes on reverse strand (color by SEED subsystems), genome structure (a circular chromosome with no gaps), GC content, GC skew. The chromosome of K. sacchari SP1T shows the highest sequence similarities ranging from 69.5% to 100% to the chromosome of Enterobacter sp. strain R4-368, which is an endophytic nitrogen-fixing bacterium isolated from the biofuel plant Jatropha curcas . The genome of the strain R4-368 comprises a single circular chromosome of 5,039,027 bp with 54.0% GC content (deposited in GenBank under the accession number CP005991) and one plasmid pENT01 of 116,007 bp with 52.8% GC content (deposited in GenBank under the accession number CP005992) . The chromosome of K. sacchari SP1T shares 4,105 genes (89.5%) with the chromosome of strain R4-368. The digital DNA-DNA hybridization values between the two chromosomes calculated by the online Genome-to-Genome Distance Calculator [14,15] (version 2.0; http://ggdc.dsmz.de) are 90.2%, 57.7%, and 86.6% under the distance Formula 1, 2 (recommended for dealing with incomplete genomes), and 3, respectively. The probabilities of same species for the two strains (DDH > 70%) assessed via logistic regression are 97.4%, 44.3%, and 98.8%, respectively. Likely, strain R4-368 belongs to the species K. sacchari. This work was supported by the National Natural Science Foundation of China (grant 31171504 and 31200003), Guangxi Key Laboratory Construction Program, Guangxi Expert Special Fund Project, and BAGUI Scholar Program of Guangxi, China.